Many people believe the old saying “you need to have money to make it.” A couple of decades ago, this saying had merit. The rise of the internet made this saying obsolete. It might seem like large corporations still have an advantage over small companies, but there are ways to level the playing field. One way for a company to achieve this is by using affordable SEO. Let’s take a look at four SEO tips that will send customers to your origami website. Google updates their algorithm on a daily basis. They do these upgrades to make sure their users find the best information online. If your website has a blog that is useful and updated on a regular basis, there is no need to worry. Google’s goal is to send their customers to websites that provide them with value. The best service anyone can provide online is information. Have a blog that offers free origami instructions & diagrams, and give readers a call to action at the end. It will bring in visitors, which raises your SEO score, and let Google know that you’re running a legit site. Google penalizes companies that have underperforming mobile websites. 78% of local mobile searches end in sales. What do those three points mean when put together? If you don’t have a mobile-friendly site, no one will be able to find you, and the ones that do won’t buy anything. That’s not what one would call a winning strategy. If it weren’t for video, the internet might not exist. More people search for videos than any other medium, and that trend will increase. Adding video to your site is easy and fun. You don’t need professional production values. Pepper them into your content and other pages. For the free origami instructions blog, post videos of you creating various designs. 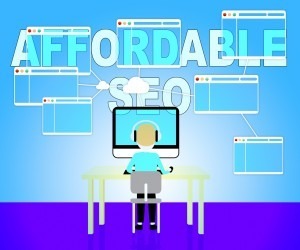 It’s affordable SEO that’s also enjoyable for the viewers! There are two types of links your site needs: internal and external. Internal are links that you add to content that lead to another part of your page. External links go to another website. Consider it a vote of confidence. You are telling readers that another site has value. The key to link building (internal link, for example) is getting other sites to post external links to you. What’s the best way to get linkbacks? Posting amazing content. We end where we started: content is king. Running a small business is hard, and SEO is a complicated process. We could post a list of 50 SEO tips, and we’d still end up leaving out a lot of things. If you’re looking for organic SEO growth that will drive visitors and sales to your site, get in touch with us today!